Partially sentient pieces of space are trying to escape the hunger of the Shade by descending to Sornieth as magical energy channeled by The Shifting Expanse's spires, then assuming a draconic form and mixing in with dragonkind. Will these fragments of the universe seek the safety they so desire? Or does the recent strengthening of the elements have implications that threaten their new livelihoods? - Ping me to be added OR removed. - You are automatically removed when you purchase a baby. - Tell me what kind of hatchling you'd like to reserve. - I will PM you for the baby that fits your specified preferences. - Claim your hatchling within 48 hours of the time I sent the PM. - If you do not respond in time, the baby will be listed on the AH. I will also accept the following items / services, though currency is still preferred! A fine piece of silver silk, elegantly draped to echo the movements of the dragon wearing it. The Novamancers, also known as the Refugees, are pieces of space fleeing from the Shade, which seeks to devour them. At the end of the Third Age, when the Shade shattered the magical barrier of the gods' Pillar, some of the barrier's magical energy radiated into space. As a result, some parts of space that were not yet swallowed by the Shade gained partial sentience, becoming aware that in order to continue existing, they must take refuge. 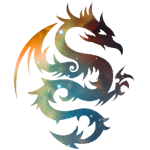 Slowly, nebula clouds gravitated toward the seemingly safe world of Sornieth, and, recognizing that nebulae were not acceptable physical forms, morphed into dragon-like appearance. These fragments of space then assimilated into clans that were willing to accept them, finding protection under welcoming wings. However, will they continue to find peace in these troubling times, when the increased strength of elemental magic is causing more chaotic dominance battles, when more scientists are becoming aware of the anomaly of their existence, and when dragonkind in general has forgotten about the threat of the Shade? It was the sound of an explosion. Perhaps it was not even a sound, for it was so deafening compared to the previous silence, it may as well have never happened. The sound’s energy was of such great magnitude that even the stars shook gently, and new ones were born from interstellar gas. When the wave of sound and magical energy eventually dissipated, the universe surrounding the newly ravaged world of Sornieth returned to its relative silence. But it was not the same. Novamancers feature bodies resembling a dark starry sky and wings patterned like a nebula cloud. In addition, their faces and limbs glow with runes in the colors of their wings, similar to the glow of distant galaxies. They have only been observed to take on the forms of pearlcatchers or spirals; why this is the case has yet to be determined. Novamancers have not been observed interacting with any dragon. They actively avoid those who attempt to approach them. Strangely, they have never been observed to eat, even when there is no dragon to scare them off from doing so. Research is still in progress to determine the cause. When submerged in warm water, this relic begins to thrum with faint power. It would take a lot of them to power anything worthwhile. Contains the Celadon Fillet, Silk Veil, Bangle, Scarf, Wing Silks, Silk Sash, Leg Silks, and Arm Silks. 8 items. Contains the Lucky Woodbasket, Woodbrace, Woodguard, Woodmask, Woodtrail, Woodtreads, and Woodwing. 7 items. Intricate patterns and rare, haunting cloth hold this finely-crafted cloak together. Intricate patterns and rare, haunting cloth hold these finely-crafted wing adornments together. Intricate patterns and rare, haunting cloth hold this finely-crafted tail wrap together. A creature of uncommon ingenuity. It harvests electricity for its patron. Full round action: slash, stab, bite! When resting in crystal, a lesser wisp will slumber contentedly. When loose, they will cause all manner of mischief! THESE SPACE FRAGMENTS ARE A POTENTIAL THREAT TO DRAGONKIND. AS A RESULT, WE HAVE DETERMINED THAT THE BEST WAY TO PROCEED WITH MONITORING THIS MAGICAL SPECIES IS TO RECORD ALL OCCURRENCE OF INDIVIDUALS AND ALERT LOCAL DRAGONS TO KEEP WATCH FOR, AND REPORT TO THEIR NEAREST ASSOCIATION MEMBER IF NECESSARY, SAID ORGANISMS' ABNORMAL OR UNSAFE BEHAVIORS. TODAY, A SPIRAL MALE WAS FOUND WANDERING THROUGH THE LIGHTNING FARM. IT WAS QUICKLY DISCOVERED THAT HE HAD NO EMPLOYEE ID, AND WAS PROMPTLY REMOVED FROM THE PREMISES. WHAT IS MOST UNUSUAL ABOUT THIS INCIDENT IS THAT THE SPIRAL WAS DESCRIBED TO RESEMBLE OUTER SPACE. RECENT MONITORING OF THE CONSTELLATIONS HAS DISCOVERED THAT STARS ARE APPEARING TO SIMPLY DISAPPEAR. ONE PARTICULAR MEMBER OF OUR ASSOCIATION, UPON HEARING ABOUT THIS SPIRAL, PROMPTLY DECLARED THAT THIS SPIRAL AND THE ABNORMALITIES IN THE STARS WERE CONNECTED. Personally, I think this is all insane, and that this spiral is just another weirdo who made his way into the Lightning Farm somehow, but since I am this association member's intern I have been forced to type up this report. He even decided to name this spiral a "Novamancer." He is absolutely a senile, old lunatic. Anyways, I doubt he will read this later. The probability of a random space-looking dragon showing up again seems rather low to me, but he keeps mumbling under his breath that "there will be more, there will be more." I can't wait until this internship is over. A NEW INDIVIDUAL OF THE MAGICAL SPECIES "NOVAMANCERS" HAS BEEN REPORTED AS OF TODAY. LIKE ITS FORERUNNER, THE SPIRAL MALE, THIS PEARLCATCHER FEMALE WAS FOUND AMONG THE LIGHTNING SPIRES. WHEN ASKED ABOUT HOW IT HAD GOTTEN THERE, IT HAD NO RESPONSE, AND WAS PROMPTLY REMOVED FROM THE PREMISES. MEANWHILE, ASSOCIATION MEMBERS AT THE OBSERVATORY REPORTED MORE CHANGES IN THE STARS, WHICH HAD NOT OCCURRED SINCE THE APPEARANCE OF THE SPIRAL MALE. WE SUSPECT THAT THESE EVENTS INDEED HAVE A CORRELATION AND WILL BEGIN INVESTIGATING. OTHER COMMENTS: I knew I was right, all this time. Everyone else scoffed at my ideas, but this, this is the pinnacle of my lifetime of work. As for that scruffy youngster who was my intern, I always knew he lacked an appreciation for cosmic magical science, but his work on the first report is just shameful. He could not be bothered to separate his personal opinion from the objective report. I hope that youngster widens his mindset eventually. More importantly, I must focus all of my energy into this project. We must explain the unexplained! NEW INDIVIDUALS OF THE MAGICAL SPECIES "NOVAMANCERS" HAVE BEEN REPORTED AS OF TODAY. WE ARE CURRENTLY INVESTIGATING THE MEANS BY WHICH THEY PROLIFERATE. RECENT SURGES IN MAGICAL ENERGY IN THE SHIFTING EXPANSE MAY BE THE CAUSE. WE ARE CONTACTING MEMBERS LOCATED THERE ABOUT THIS ISSUE. NEW INDIVIDUALS OF THE MAGICAL SPECIES "NOVAMANCERS" HAVE BEEN REPORTED AS OF TODAY. UNFORTUNATELY, DUE TO UNPRECEDENTED OVERALL INSTABILITY OF MAGICAL WEATHER PATTERNS IN THE SHIFTING EXPANSE, OUR RESEARCH HAS BEEN UNABLE TO ATTRIBUTE THE MAGICAL SURGES TO THIS SPECIES' PROLIFERATION. CURRENTLY, MOST OF OUR RESOURCES ARE DIVERTED TO DETERMINING THE CAUSE OF RECENT FLUCTUATIONS IN MAGIC ALL ACROSS SORNIETH, BUT WE CONTINUE TO STRIVE TO UNCOVER THE MYSTERIES OF THESE ORGANISMS. NEW INDIVIDUALS OF THE MAGICAL SPECIES "NOVAMANCERS" HAVE BEEN REPORTED AS OF TODAY. NOW THAT RESEARCHERS HAVE ESTABLISHED THE NEW BENCHMARK FOR LEVELS OF MAGICAL ENERGY HITTING THE SPIRES, WE ARE ABLE TO CORRELATE ABNORMAL SURGES TO THE APPEARANCE OF THESE ORGANISMS. SINCE IT IS MOST LIKELY IMPOSSIBLE TO TEST FOR CAUSATION, WE CAN ONLY CONTINUE TO COLLECT DATA AND CONFIRM THAT THE SURGES ARE PERIODIC AND ABNORMAL WITH HYPOTHESIS TESTING. IN THE MEANTIME, WE WILL BEGIN FOCUSING OUR RESEARCH ON THE ORGANISMS THEMSELVES. WE INTEND TO CREATE A DESCRIPTION OF THEIR GENERAL CHARACTERISTICS. NEW INDIVIDUALS OF THE MAGICAL SPECIES "NOVAMANCERS" HAVE BEEN REPORTED AS OF TODAY. THROUGH OUR OBSERVATIONS, WE HAVE DETERMINED THAT NOVAMANCERS TEND TO AVOID INTERACTING WITH OTHER DRAGONS. SPEECH HAS NOT YET BEEN OBSERVED IN THEM, WHICH HINTS AT AN ALIEN NATURE. IN THE MEANTIME, OUR ARCANE ASSOCIATES CONTINUE TO REPORT SIGNIFICANT TRANSFORMATIONS IN THE CONSTELLATIONS. WE HOPE THAT THIS INFORMATION WILL HELP US CONFIRM THESE NOVAMANCERS' ORIGINS. NEW INDIVIDUALS OF THE MAGICAL SPECIES "NOVAMANCERS" HAVE BEEN REPORTED AS OF TODAY. FURTHER OBSERVATIONS HAVE REVEALED THAT WHILE NOVAMANCERS TEND TO AVOID OTHER DRAGONS, SOME EXPRESS INTEREST IN CERTAIN INANIMATE OBJECTS. THE NOVAMANCERS PRESENT IN SORNIETH LONGER EXHIBIT THIS BEHAVIOR TO A GREATER DEGREE. WHAT MAKES AN OBJECT OF INTEREST FOR THESE LARGELY MYSTERIOUS ORGANISMS? BY RECORDING WHAT WE WITNESS THEM TAKING INTEREST IN, WE MAY BE ABLE TO COME UP WITH A GENERALIZATION. NEW INDIVIDUALS OF THE MAGICAL SPECIES "NOVAMANCERS" HAVE BEEN REPORTED AS OF TODAY. THE TEAM OF RESEARCHERS WORKING TO RECORD WHAT THESE ORGANISMS TAKE INTEREST IN HAVE RETURNED WITH RESULTS SUGGESTING THAT THEY ARE ATTRACTED TO MAGICAL OR ENCHANTED OBJECTS. ONCE A NOVAMANCER FINDS SUCH AN OBJECT, THEY THEN CARRY THE OBJECT AROUND AS A KEEPSAKE OF THEIR HOARD. IN ADDITION, THEY TEND TO LINGER WHERE DRAGONS ARE PRACTICING MAGICAL SPELLS AND WATCH THE SPELLCASTERS. WHY ARE THEY OBSESSED WITH THINGS PERTAINING TO MAGIC? WE HAVE CONSIDERED SEVERAL HYPOTHESES, BUT FURTHER EVIDENCE WILL SIGNIFICANTLY ASSIST OUR PURSUIT OF THE ANSWER TO THIS QUESTION. NEW INDIVIDUALS OF THE MAGICAL SPECIES "NOVAMANCERS" HAVE BEEN REPORTED AS OF TODAY. THE RESEARCH TEAM FOCUSING SPECIFICALLY ON THE OCCURRENCE OF NORMAL DRAGON BEHAVIOR IN THESE MYSTERIOUS CREATURES HAVE REPORTED THAT IT IS APPROPRIATE TO CONSIDER THEM AS HAVING THE MINDS OF HATCHLINGS IN THE BODIES OF DRAGONS. THEY EXPERIENCE LEARNING PROCESSES, THOUGH AT A COMPARATIVELY SLOWER PACE COMPARED TO THE AVERAGE HATCHLING. IN ADDITION, ONE SPECIFIC NOVAMANCER, NOV - 013, APPEARS TO BE ABLE TO EXPRESS CONFUSION THROUGH SPEECH. THIS SUGGESTS THAT THESE ORGANISMS MAY BE AT LEAST PARTIALLY SENTIENT, BUT THIS CASE MAY BE AN ANOMALY SINCE WE HAVE YET TO OBSERVE SPEECH IN OTHER NOVAMANCERS. IF, HOWEVER, WE ARE ABLE TO CONFIRM SENTIENCE, COULD WE CONSIDER THESE ORGANISMS TO BE PART OF DRAGONKIND? THE ANSWER AWAITS US AS WE FURTHER PURSUE OUR RESEARCH. NEW INDIVIDUALS OF THE MAGICAL SPECIES "NOVAMANCERS" HAVE BEEN REPORTED AS OF TODAY. CONSIDERING THAT TODAY IS THE START OF THE THUNDERCRACK CARNIVALE, THE HEIGHTENED MAGICAL ACTIVITY COULD BE A REASON WHY NEW NOVAMANCERS APPEARED AT THIS TIME. NEW NOVAMANCERS HAVE ALWAYS CORRELATED WITH SURGES IN LIGHTNING MAGIC; AS A RESULT, THE ASSOCIATION HAS DECIDED ON A NULL HYPOTHESIS: THAT NOVAMANCERS NEED THIS ENERGY IN ORDER TO INITIATE EXISTENCE IN SORNIETH. BUT DID THEY EXIST AS AN ORGANISM BEFORE BEING IN SORNIETH? THE TIMES WHEN THE NOVAMANCERS APPEAR ALSO CORRELATE TO THE TIMES WHEN FEATURES OF SPACE SUDDENLY DISAPPEAR. THUS, OUR ADDITIONAL NULL HYPOTHESIS IS THAT THESE NOVAMANCERS COULD BE LIVING PIECES OF SPACE, COMING TO SORNIETH FOR REASONS YET UNKNOWN. THERE IS SO MUCH THAT IS STILL UNEXPLAINED, BUT INVESTIGATIONS WILL HAVE TO WAIT UNTIL AFTER THE FESTIVITIES. NEW INDIVIDUALS OF THE MAGICAL SPECIES "NOVAMANCERS" HAVE BEEN REPORTED AS OF TODAY. AFTER THE CARNIVALE, ALL RESEARCHERS INVOLVED WITH THE NOVAMANCERS WERE ASSEMBLED TO DISCUSS THEIR THOUGHTS AND OBSERVATIONS. THE RESEARCHERS TENTATIVELY AGREED ON THE HYPOTHESIS THAT THE NOVAMANCERS ARE LIVING PIECES OF SPACE. HOWEVER, WITH THE MAGICAL APPEARANCE OF THE NEW PRIMARY GENE ‘STARMAP,’ MORE DRAGONS HAVE BEEN CLAIMING THEIR LINKS TO THE STARS, PROVING DISTRACTORS TO OUR RESEARCH. IN ADDITION, WHILE COSMIC BEINGS WOULD LOGICALLY ALSO MANIFEST SUCH A GENE AS A PRIMARY, TODAY’S NOVAMANCERS WERE REPORTED TO LOOK AS THEY ALWAYS HAVE. SOME OF THE RESEARCHERS BELIEVE THIS DISCREDITS STARMAP, WHILE OTHERS BELIEVE IT CAN BE EXPLAINED BY HOW NOVAMANCERS ARE FORMED. MORE INSIGHT IS NECESSARY TO ANSWER OUR QUESTIONS. DUE TO THE STARMAP CONTROVERSY, RESEARCHERS HAVE BEEN SCRAMBLING TO COLLECT EVIDENCE THAT WOULD SUPPORT THEIR SIDES OF THE DEBATE. THOSE LOOKING TO EXPLAIN THE LACK OF STARMAP DUE TO THE NOVAMANCERS’ FORMATION HAVE BEEN INVESTIGATING EVERY ASPECT OF THE SHIFTING EXPANSE; SOME HAVE SET UP DEVICES TO CAPTURE A MOVING PICTURE OF EVERY LIGHTNING SPIRE IN AN ATTEMPT TO VISUALLY RECORD THE PHYSICAL BODY FORMATION, BUT THE EXTREME OVEREXPOSURE OF THE IMAGES TO THE LIGHTNING HAS DETERRED THEIR INVESTIGATION. THOSE LOOKING TO DISCREDIT STARMAP HAVE RESORTED TO INTERVIEWING DRAGONS WITH THE PRIMARY, AND HAVE DISCOVERED THAT MANY SIMPLY USED A GENE SCROLL. OTHERS HAVE FORMED A RADICAL GROUP CALLED “BIRTHERS” WHO BELIEVE THAT NOVAMANCERS ARE ACTUALLY BORN BY ACTUAL DRAGONS, THEN DROPPED IN THE MIDDLE OF THE LIGHTNING FARM AS A PRANK. ANOTHER ASSEMBLY, HOPEFULLY TO RESOLVE THIS DEBATE, WILL OCCUR WHEN THE NEXT BATCH OF NOVAMANCERS APPEAR. MANY POINTS WERE DISCUSSED AT TODAY’S ASSEMBLY, BUT THE MOST EXCITING PIECE OF EVIDENCE PRESENTED, ALBEIT NOT VERY HELPFUL TO END THE DEBATE, WAS THE RECORDED MOVING PICTURE OF NOV - 033’S FORMATION. SEVERAL MINUTES AFTER A LARGE BURST OF LIGHTNING HITS THE SPIRE, IT SLOWLY FADES INTO VISIBILITY, STARTING FROM THE HEAD AND DOWN TO THE TAIL, IN THE MEANTIME SURPRISING THE TECHNICIANS THAT WERE NEARBY. AN ENTIRELY NEW DISCUSSION SPROUTED FROM THIS MOVING PICTURE, AND ONE RESEARCHER SUGGESTED THAT IF THESE NOVAMANCERS ORIGINATED FROM SPACE, THEN THEY WOULD NEED A REFERENCE IN ORDER TO FORM THEIR PHYSICAL BODIES. IN THIS CASE, THE TECHNICIANS WERE THE REFERENCE. MANY RESEARCHERS FOUND THIS IDEA WORTH INVESTIGATING, AND THE ASSEMBLY ENDED ON A LESS DIVISIVE NOTE AS THEY LEFT TO START COLLECTING DATA. AT THE ASSEMBLY TODAY, A GROUP OF RESEARCHERS CONFIDENTLY PRESENTED THEIR THESIS THAT NOVAMANCERS DID INDEED BASE THEIR APPEARANCES OFF EXISTING DRAGONS’ APPEARANCES, WHILE STILL MAINTAINING THEIR GALAXY LOOK. THEIR EVIDENCE WAS POPULATION DATA THAT ONLY 10% OF WORKERS IN THE LIGHTNING FARM POSSESSED THE STARMAP GENE. THE NOVAMANCERS THAT APPEARED TODAY THUS HAD ONLY A SMALL CHANCE OF FORMING NEAR A WORKER WITH STARMAP, WHICH EXPLAINS THEIR CRYSTAL PRIMARIES. MOST ATTENDEES HAD NO OBJECTIONS, SO THE ASSOCIATION HAS DECIDED TO ADOPT THE GROUP’S THESIS AS THEIR CURRENT PERSPECTIVE OF WHAT INFLUENCES A NOVAMANCER’S APPEARANCES. WHAT THE RESEARCHERS COULD NOT PROVIDE A LOGICAL ANSWER TO, THOUGH, IS WHY NOVAMANCERS LOOK LIKE OUTER SPACE. THEY FOUND NO OTHER LIGHTNING FARM WORKER WITH A SIMILAR COLOR SCHEME. TODAY WAS A PARTICULARLY EXCITING DAY FOR THE ASSOCIATION, WHICH SPECIFICALLY PAID DRAGONS WITH STARMAP TO STATION THEMSELVES NEAR SPIRES FOR THE PAST SEVERAL DAYS. AFTER A PARTICULARLY JOLTING LIGHTNING STORM, THE FIRST NOVAMANCER WITH STARMAP WAS OBSERVED. A MAJORITY OF RESEARCHERS AGREED THAT THE ASSOCIATION’S ACTIONS COULD BE CONSIDERED AN EXPERIMENT AND THUS ALLOWS FOR CLAIMS OF CAUSALITY, BUT THEIR PEERS, ESPECIALLY THOSE WHO ARE NOT MEMBERS OF THE ASSOCIATION, CRITICIZE SUCH A CLASSIFICATION BECAUSE OF A LACK OF A CONTROL GROUP AND OTHER FEATURES OF A GOOD EXPERIMENT. HOWEVER, GIVEN OUR RESEARCH FOCUS, GOOD EXPERIMENTS ARE NOT VERY FEASIBLE, AND OUR RESEARCHERS HAVE BEGUN TO SETTLE FOR LESS THAN THE STANDARD QUALITY. WITH MORE WORKERS OF THE LIGHTNING FARM NOW BEARING STARMAP PRIMARIES, IT WAS UNSURPRISING THAT THERE WAS YET ANOTHER STARMAP NOVAMANCER REPORTED TODAY. FOR THE MOST PART, RESEARCHERS HAVE RETURNED THEIR FOCUS TO WHAT THEY WERE INVESTIGATING BEFORE STARMAP APPEARED IN SORNIETH. MEANWHILE, THE TEAM OF RESEARCHERS THAT HAVE BEEN STUDYING WHAT NOVAMANCERS ARE ATTRACTED TO HAVE FILED A REPORT THAT MAGICAL OBJECTS THAT COME INTO AN EXTENDED PERIOD OF CONTACT WITH A NOVAMANCER END UP LOSING THEIR MAGICAL PROPERTIES. THEY PRESENTED THE HYPOTHESIS, ALONG WITH SEVERAL RESEARCHERS ON THE BEHAVIORAL OBSERVATION TEAM, THAT NOVAMANCERS DO NOT FIND SUSTENANCE FROM NORMAL FOOD, AND INSTEAD RELY ON MAGIC TO STAY ALIVE. THE ASSOCIATION HAS SCHEDULED AN ASSEMBLY TO DISCUSS THEIR FINDINGS. THE ASSOCIATION HAS DECIDED THAT THE EVIDENCE PRESENTED WAS CONVINCING ENOUGH TO CONCLUDE THAT NOVAMANCERS DO INDEED RELY ON MAGIC TO SURVIVE. A NEW TEAM OF RESEARCHERS HAS BEEN ORGANIZED TO FIGURE OUT HOW EXACTLY NOVAMANCERS’ METABOLISM WOULD WORK, OR MORE BROADLY, HOW THEIR PHYSICAL FORMS FUNCTION. IN THE MEANTIME, ANOTHER TEAM THAT HAS BEEN STUDYING THE NOVAMANCERS’ FORMATION HAVE MANAGED TO SUCCESSFULLY MEASURE THE MAGIC AND MATTER CONCENTRATION NEAR A LIGHTNING SPIRE WHERE A NOVAMANCER APPEARED. THEY RECORDED A SHARP INCREASE IN BOTH MAGIC AND MATTER, THEN A GRADUAL INCREASE IN CONCENTRATION, AND THEN A SHARP DECREASE. THEY ARE EXTENDING THEIR RESEARCH IN ORDER TO PRESENT A CLEARER CONCLUSION. Some free-to-use graphics to decorate dragon bios or signatures! Will work on more in the future. Is this open for posting? O: I hope so, if not, please let me know and I'll delete my post!! Yes, it's open! As for the pinglist, I'm actually expecting a nest of 3 to hatch in the next 24 hours (need to hear back from my nester). I'll ping you then!